In 2008, I posted this question online - "Manual focus - when is it useful?" At that time, I was using digital DSLR with all the "haft press to quickly autofocus" practice. For me, manual focusing is too slow to capture the "candid moment", which I was after back then. For that question in Photo.net, I got many replies, all make senses but still suggest that manual focus seems not to suit me well. Only when I started using the OM (SLR) cameras - then the rangefinder, manual focus has changed my way of seeing, for better or worse. Simply that with these cameras, I have better ways of telling me whether the subject is in focus or not, rather than guessing on a small viewfinder of the Olympus E620. There is one important thing I realize from that experience : "Manual focus strengthen the connection between me and my subject". Why? With manual focusing, you simply observe the subject with much more attention and... focus. By checking if one's eyes are in focus, you also notice how she smiles, how the hairs look or how the background changes, etc... With rangefinder, you might have to guess the distance between the subject and yourself to pre-focus the lens even before raising the camera up. Slower speed, but much higher attention! And from there, the connection is established - I think. Last but not least, by focusing manually, you lend yourself much more towards the serendipity, which to me is the wonderful joy of photography. Who do not enjoy the surprised gift? Take this as an example. Here is my favorite shot from the trip to Vietnam in 2012. 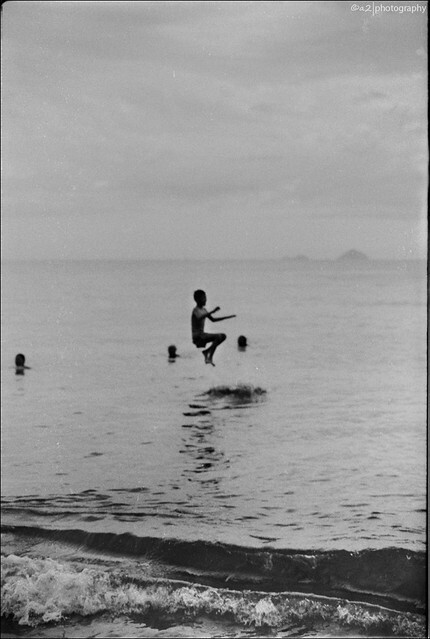 I saw the boy jumping while walking along the beach in the morning. I was not sure if I got it until I saw the scan and smiled happily.